If Ya Gotta Have your Morning Joe, Make It Right! Some of you must have your coffee and since our first cleanse, John looked carefully at the benefits of coffee and determined that in fact, the right coffee in small amounts, can make a difference in your diet. ORGANIC, HIGH QUALITY, LIGHT ROASTED COFFEE BEANS are the only way to go when drinking coffee. High quality coffee beans are those that are grown in the shade, at high altitudes. If the label doesn’t display origin, then there is no way of knowing the quality and the beans should be avoided. Lightly roasted or blond roasted is what to look for in a roast. Grind these in a coffee grinder at home and then brew in a French press for around 5-10 minutes. 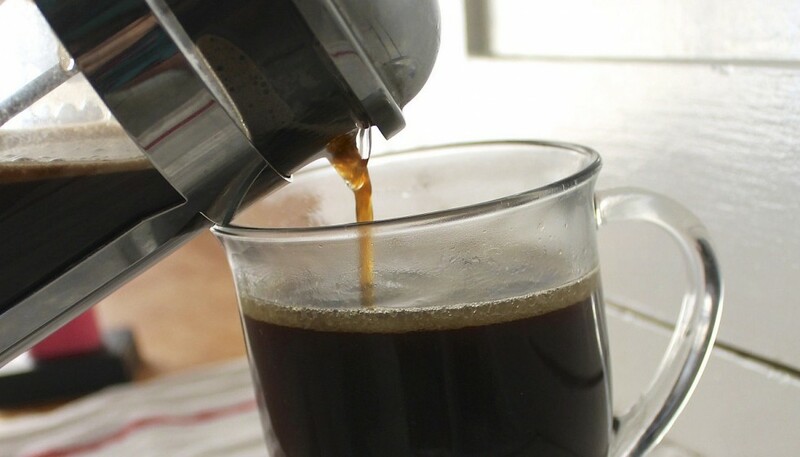 After it steeps for 10 minutes, pour this hot coffee, serve it black or, for a frothy “latte”, pour into a blender with 1-2 tablespoons of the Kerry Gold, unsalted, Irish grass-fed butter, and 1-2 tablespoons of the extra virgin coconut oil (for making about 16 oz of this coffee). Blend until frothy (just a few seconds) for a “latte”. Alternatively, you can replace coconut oil with MCT oil. MCT oil stands for medium-chain triglycerides. This is a stronger form of coconut oil. This is a wonderful replacement for milk or cream and we will cover this in much more detail in our Spring Finding Your Food Map retreat on Martha’s Vineyard. MCTs stands for medium chain triglycerides. MCT oil does not go through the lymphatic system. Instead, these fats are transported directly to the liver where they are metabolized or converted into ketones (which can be used for fuel by the brain) in the process. They bypass the digestion process that longer chain fats go through, providing an alternative energy source for the body and are less likely to be stored inside fat cells. Look for it in your health food store or online. Start with one tablespoon and slowly add more as needed, but BE CAREFUL because MCT oil can run right through you! Some folks want a sweetener in their coffee. Xylitol derived from North American hardwood could be added for a touch of sweetness. The best brand name is Xyla(R). Mold can be a problem with coffee. The way to avoid mold is to purchase coffee from small batch companies. Cheap beans equal a low quality of beans that are damaged and are more susceptible to molds (you will not see the mold on the beans as they are invisible). These molds are the result that producers often take when processing coffee beans quickly or cheaply. Mold toxins are not only found in coffee, they are commonly found in many crops. Mold secrete toxins that may be found in wheat, corn, peanuts, black pepper, nutmeg, wine and fruits. This is a tricky, sneaky business because there really is no way of telling for sure what has molds and what is clean and, for the most part, they are tasteless. Higher quality foods will contains less molds. The effects of the molds on our bodies can be extreme. Fatigue, fogginess, could very well be the result of mold toxins.